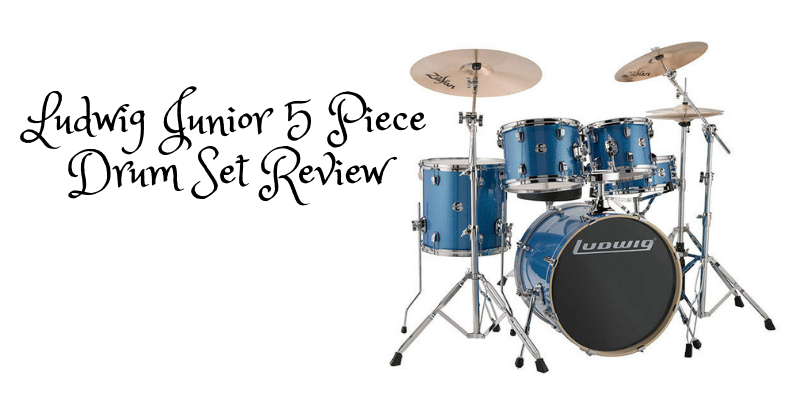 Ludwig Junior 5 Piece Drum Set Review - why it's awesome? Ludwig are one of the giants of the drum world, they have been making the finest quality kits for over a century, and these have been used by some of the most famous drummers in history. These including Ringo Starr, Carmine Appice, Ginger Baker, Bill Bruford, Mick Fleetwood, Don Henley, Nick Mason, Keith Moon, Charlie Watts, and the greatest rock drummer of all time, John Bonham. But what has all that got to do with their cheapest beginner drum kit for kids? Well in my opinion. A lot more than you would think. If for example Ferrari, decided to make a cheaper car, do you think they would tell their engineers to turn their brains off and lower their standards? And ultimately lowering the companies reputation. I don’t think so. And neither have Ludwig, yes it’s a cheap drum set for kids, but it still has the legendary Ludwig name on it, and I think that says a lot. The Ludwig jr Drum Set is exactly what it says on it, a Ludwig, through and through. But before we go into how much of the companies reputation has been put into this in-expensive kit, and exactly how good it is? We’ll answer a few questions that parents usually have when looking for the best drum set for their child. Who is the Ludwig jr Drum Set designed for? As the name dictates, this is a junior drum kit, so it has a smaller 16” kick drum. The bars of the drum throne (stool to non-drummers) and the snare stand are also shorter than they would be on an adult drum set. These are the only three differences between this and an adult set. These differences, do however dictate, that the drum set is recommended for children who are shorter than 5ft. If not, they will sit much higher than the height of the snare drum. This will not only be uncomfortable but will also hinder their movement and affect their playing ability. We personally always recommend going a little below the maximum height range, because you want your little drummer to grow with and into the kit. Kids grow incredibly quickly, so if your child is approaching the upper limits of 5-foot, they would be far better off with an adult kit. On the other extreme, this kit is not for any child that is shorter than 3ft. This is mainly because they would find it difficult to reach the kick drum pedal. So in summary, this kit is for any child from 3-foot to 5-foot, but to be honest, if they are over 4 foot 8 inches, they would be better off with an adult kit that they can grow into. 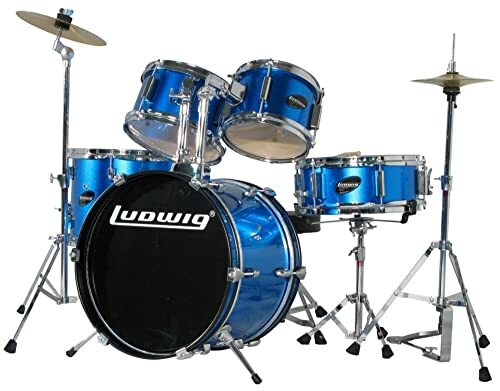 The Ludwig jr Drum Set, which is also known as Ludwig LJR106, comes in one box measuring about three foot by three foot and weighs in at around 50 pounds. The box shows a beautiful picture of a perfectly set-up drum kit. But obviously, everything inside is not set up and you will require a good hour, if not more, to make it look like the picture. Inside the box, you’ll find the drum shells, cymbals, and the seat. The smaller boxes contain all the hardware and screws you’ll need. If you’ve never set up a drum kit before, don’t worry, it isn’t that difficult. We would also recommend watching some Youtube videos on how to set up a drum kit before starting. These will not only show you, what goes where. But, also get you used to the technical terms, so you know what’s what and where to put it. The Ludwig jr drum set comes with all the hardware you’ll need. As well as a kick drum pedal a Hi-hat, and a Ride/Crash cymbal. You’d also get a drum key, which is needed for assembly, as well as ongoing tuning. You’ll also get a basic pair of drumsticks so your child can start their drumming future right away. The kit also features a 1-year warranty against manufacturer’s defects. What do you need to look for when buying a kids drum set? So now that you know what you get in the box, we’ll look at the 4 most important criteria for any kids drum set. They are the color, the sound, the setup, and it’s durability. Color definitely shouldn’t be ignored. If your little drummer likes the way their drums look and their color, they will be much more likely to play them. By playing, they will improve and who knows what the future could hold for them. So, make sure you’re either certain what your child’s favorite color is or ask them what color they would like their drum set to be in? 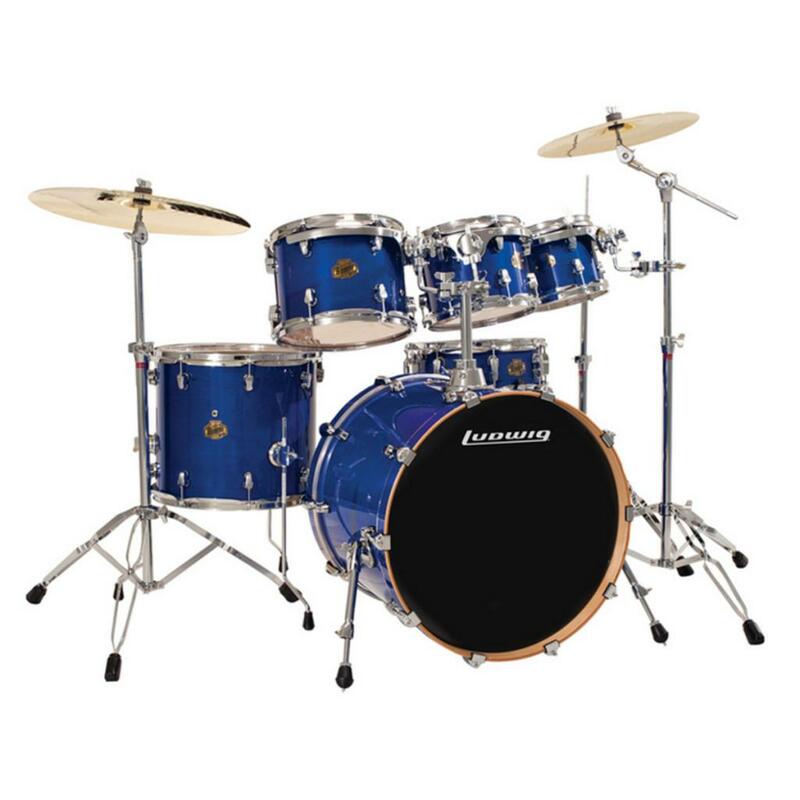 The Ludwig jr drum set offers three color options: blue, black and wine red. If your child has their heart set on another color, you might be better off with the Mendini junior drum set. This would give you seven color options. How does the Ludwig jr Drum Set sound? Let’s be 100% honest, younger students don’t actually care that much about how a drum set sounds. Their ears haven’t developed enough in terms of drum sounds to actually tell much of a difference at this stage. Kids usually just want to have fun hitting the drums. The finer details of good drum sounds are more important as their playing improves. As they become more knowledgable, about what a good drum set actually sounds like. That said, the Ludwig Jr drum set sounds great out of the box. And if you have a drummer friend, get them round to give it a proper tuning and to dampen down the kick drum. The good news is that any drum set can be made to sound reasonably good with the help of some tape and the right tuning. Because the sound depends more on the heads than on the drum shells themselves. If you haven’t got a drummer friend, don’t worry, good old Youtube can come to the rescue once again. Just watch a few videos on drum tuning and how to dampen the kick drum, and you should be fine. Then have a go yourself and see if the drums sound better, if they do great. If not, no problem, loosen the skins off a little and have another go. As with everything, it’s only a case of practice. As mentioned, the kick, the snare, and the toms sound good, especially after tuning. But as with many lower-priced drum kits, the cymbals sound very average. They do sound better than the ones you get with a Mendini or Gammon junior drum set because they are more sturdy. But, they still only sound average at best. Although this isn’t good, it’s the same as with all other kids drum sets. Good quality cymbals are expensive, and whenever anyone, including the mighty Ludwig, cut corners to reach a certain price point for a drum kit, the cymbals will suffer. But there is some good news, kids, on the whole, don’t care about the cymbal sound that much, when they start off. And when they do start caring about it, just replace the cymbals with better ones, easy as that. Is the hardware on the Ludwig jr Drum Set durable? The answer is a definite yes. You obviously wouldn’t expect high-quality pro hardware at this price. But all the rods and screws are made of durable aluminum and should last a long time. The snare stand and the drum throne, in particular, are far more sturdy than those made by Gammon or Mendini. The Setup is crucial. And because the Ludwig is exactly the same as an adult drum set, it can be set up in exactly the same way. It does feature fewer cymbals than most adult kits, but these can be added whenever it’s convenient. This is why you should set the kit up in exactly the same way as an adult set. Therefore, when your child moves on to an adult kit, everything will be in exactly the same place. And the transition to the adult kit will be effortless. 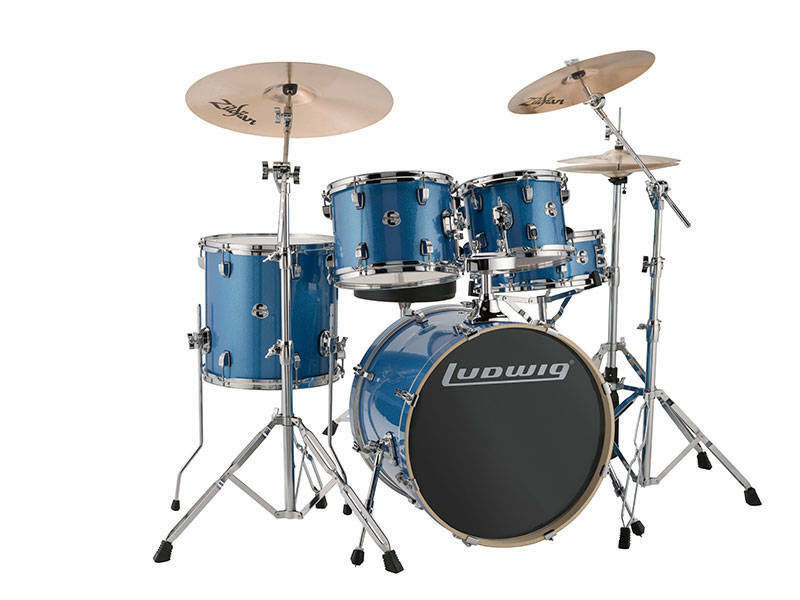 The Mendini and Gammon junior drum sets do come very close to an adult set-up, but only the Ludwig allows for the exact same positioning of every part. Great sounding kids drum kit. Allows for the exact same set-up as an adult kit. Cymbals don’t sound good and will need replacement with time. Only one cymbal, two would have been nice. So, should you buy a Ludwig jr Drum Set? 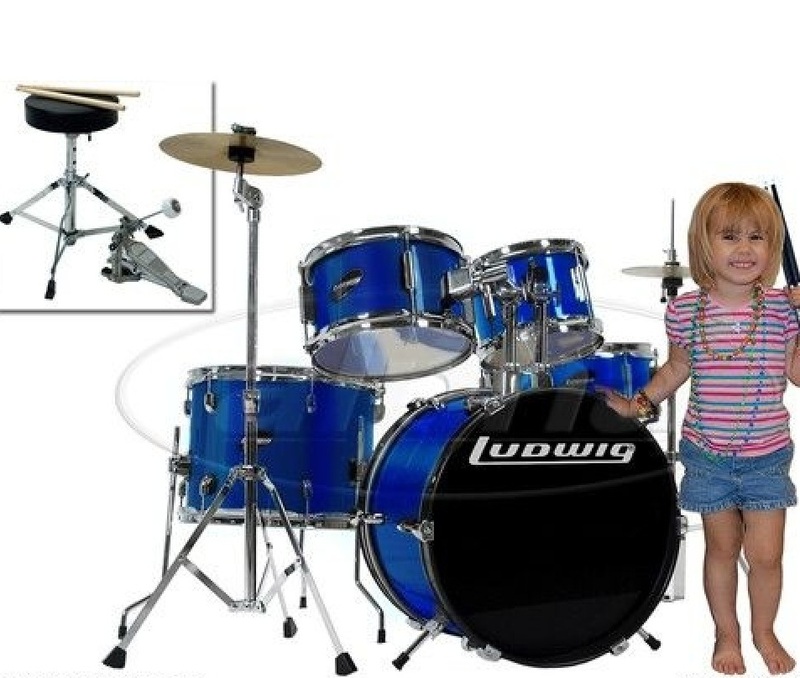 Taking everything into account, the Ludwig jr drum set is a great first kit for a child. The sound is similar but slightly better than, the other junior drum sets within similar price ranges. The cymbals are also slightly better than its competitors, but, we have to admit they are still low quality. The Ludwig jr does have significantly better hardware. And, most importantly, its setup will enable your child to learn the right motions. Ready for transitioning to an adult kit. The only disadvantage of the Ludwig jr drum set is that it’s quite a bit more expensive than either the Mendini and Gammon. But, you do get what you pay for. Plus it’s a much more recognized brand and will keep its resale price far better than the others.